We understand that many businesses find it difficult to trust a PPC management company to work on their account. After all, you are the expert at your business so your knowledge is important for making advertising decisions. That’s why at Bonza Marketing our first priority is to understand your business objectives and all necessary details before touching your PPC account. We then combine our knowledge of your business and our expertise with Pay per Click to engineer high performing campaigns. We are a dynamic and flexible organization and can work with small to medium size business across all industries. We offer bundle solutions covering search advertising to mobile advertising and more. We also allow our clients to pick and choose a specific service if the bundle solutions are not required. 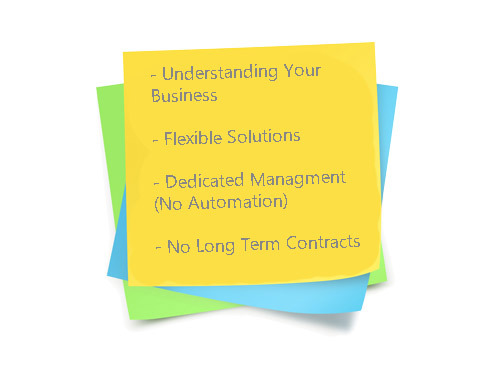 At Bonza we understand your business has enough commitments and that’s why we offer month-to-month contracts with no long term commitments. Why choose Bonza for PPC management?